In NES Replay, we go through each NES game from A-Z to see if they're any good. Today: 3D World Runner. The Tale of 3D World Runner, or, a Play in Four Acts. The young, dashing, virile REVIEWER sits at his desk. His computer is turned on and at the ready, while his WIFE sits in the other room on her iPad. 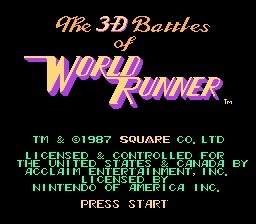 All right, now it is time to try out 3D World Runner! It’s by Square, so it should be good! Reviewer clicks a few icons on his computer and begins to play. Oh, look, these graphics are actually pretty neat! There are some columns blocking my path, so I had better not hit them! This music is also very bouncy and light! I shall have fun today! Boy, this is more difficult than I thought! Why don’t I have a weapon? I am so tired that I shall run into a column. A MUSHROOM pops out of the column. A mushroom! What luck! It looks so inviting, and I have been trained since birth to believe that mushrooms are good for video game characters, so I will pick it up! Reviewer’s character dies after touching the mushroom. Well, that is unfortunate, and more than a little odd. This game is also quite repetitive and difficult to control, as well as boring. This music is still nice and fun, though. Reviewer is looking at his wife with an embarrassed look on his face. Will you please turn the sound down on that stupid game? That is indeed something I can do, for indeed I should like to claw my own ears out with a rusty screwdriver. I shall put it at a volume that it will not disturb you, but will only bother me. Why are you talking like that? You’re weird. Verily this is true! However, I have found the weapons in this game, and I am making great progress! I have fought a boss, and now I shall get to the next world, where surely the music in the game must change! Reviewer gets to the next level. Reviewer is huddled under the desk while the music continues to play, mocking his very soul. If you hate this game so much, why don’t you stop playing? Why did I marry you again?